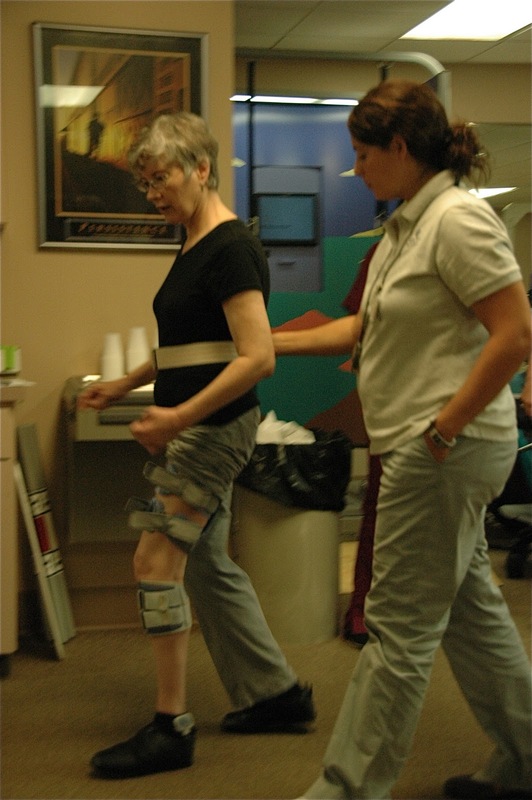 I have been feeling like the bionic woman in outpatient therapy ever since Ashley, my physical therapist, started putting the Ness L300 on me. Specifically, the Ness L300 applies mild electrical shocks to stimulate and hopefully “reeducate” the nerves and muscles that make the ankle lift my foot up so that I can step out instead of dragging my foot and rolling my ankle, something that destroys my balance. Last week Ashley presented an offer I couldn’t refuse: to be one of the “guinea pigs” for an inservice training session on the Ness L300 foot drop system that I was already familiar with and the new Ness L300 Plus system for the upper leg. Bioness, Inc. developed both medical devices for use with patients with neurological injury or disease that affects their ability to walk. With the L300 I can walk faster, with better balance and with a gait that is not so floppy looking. Bioness representatives presented yesterday’s inservice session for the therapists at the neuro rehab center where I go for therapy. As a guinea pig I had the opportunity to try the L300 Plus. 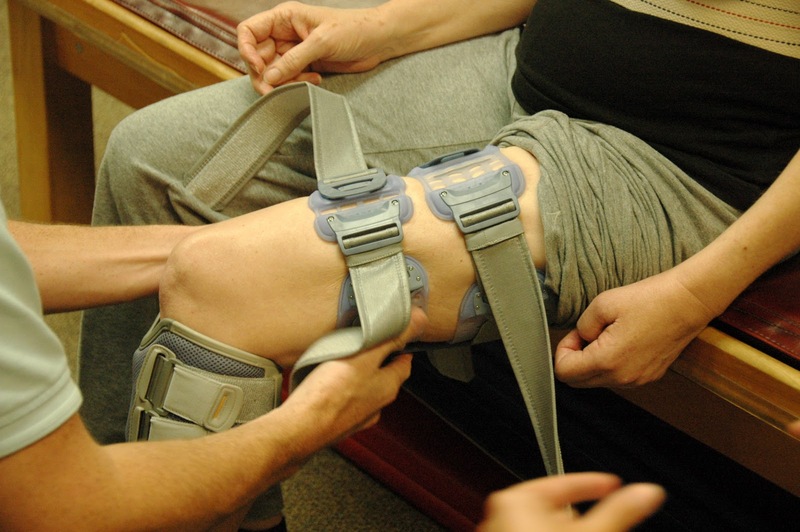 A streamlined, lighter-weight cuff for the thigh adds stimulation and reeducation for knee action. My therapist and a Bioness rep put the familiar cuff of the L300 just below my knee, then struggled with arranging the L300 Plus high on my thigh. I haven’t worn a dress or skirt since my stroke, but I definitely needed one in this instance. 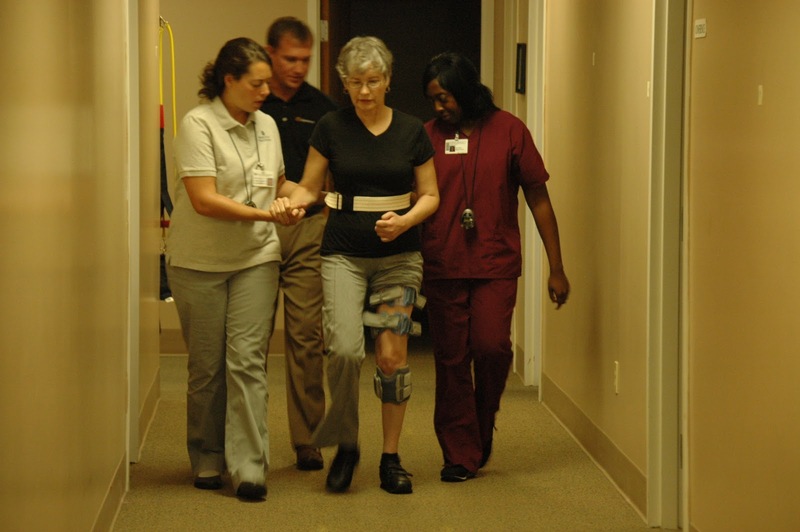 Once it was in place, Ashley walked me down the hall as the assembled rehab staff observed. Therapist Ashley takes me for a maiden voyage with the L300 Plus. Ackk!!! It felt like a jumble of conflicting signals going off in my leg. I felt out of control and with my hard-won balance in danger of disintegrating. 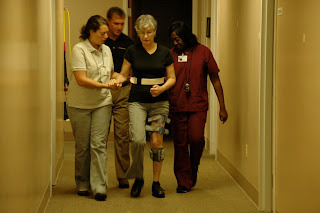 Ashley, left, a Bioness rep, and rehab assistant Brittany keep me safe for a speedier walk. The therapists and reps huddled. Their verdict was actually good news. They decided that I have regained enough of my knee function that the newest device is not for me! *The photos above are thanks to husband Walter. Hey! You're too good for it! Woo hoo! I know, silly way to put it, but it's kinda true. Wonderful! GREAT progress! Will you still be using the one below the knee, or are you now device free? That is amazing. How wonderful that what you were feeling was a failure turned out to be a huge plus. Keep up the great work. I expect every achievement is a major milestone on this slow journey for you. I continue to wish you the very best of luck, but with your determination luck is probably just the icing on the cake. tell Walther he did a great job documenting your bionic you. i am so happy to hear you have passed another milestone. your blog has been a learning experience for me, i did not know about all these contraptions for rehab. What wonderful news. I am amazed at what you are doing.